Nancy Pelosi, leader of the Democrats in the U.S. House of Representatives, and Congressman Dwight Evans spoke to reporters while visiting The Food Trust in Philadelphia on Monday, June 26, 2017. 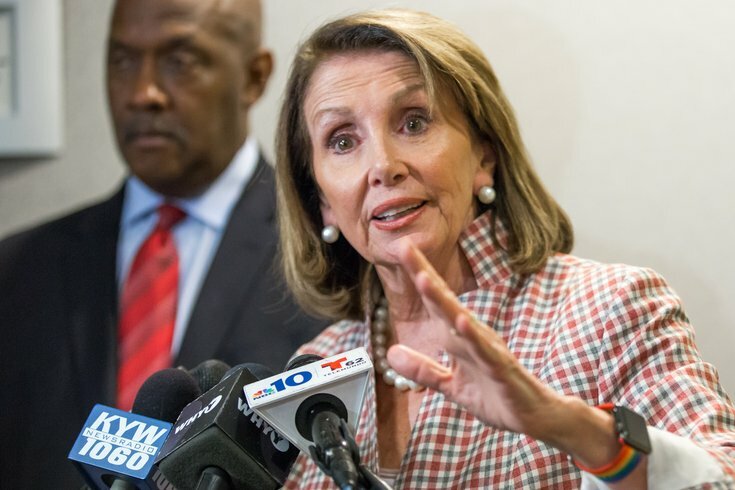 During a Monday trip to Philadelphia, U.S. House Minority Leader Nancy Pelosi condemned the draft of the health care bill that was publicly released late last week. "There is a definite movement afoot ... to deconstruct government," she said after a closed forum hosted by The Food Trust held to discuss issues facing women locally and nationally. While she listed a host of deconstruction examples, Pelosi primarily spoke about the efforts of Republicans to repeal and replace Obamacare. "It is a horrible bill. It is the worst piece of legislation in the history of Congress," Pelosi, 77, said of the proposal, which even some Republicans oppose and which faces an uncertain future. During an appearance on "CBS This Morning" earlier in the day, she took her criticism one step further. "We do know that many more people, hundreds of thousands of people, will die if this bill passes," she said. During her Philadelphia appearance, at which she was hosted by U.S. Rep. Dwight Evans, D-Pennsylvania, she said the bill, as it stands now, will have a huge negative impact on women and children, in particular, especially those with pre-existing conditions. Evans deemed the Republican health care proposal as closed-door legislation crafted by "13 white guys." That includes U.S. Sen. Pat Toomey, a Republican who represents Pennsylvania. At the event, Pelosi learned that the U.S. Supreme Court had allowed most of President Donald Trump's travel ban aimed at six majority-Muslim countries to go into place before deciding the case in October. She had little to say on the decision, other than calling the travel ban "counter to our Constitution." Pelosi, who is facing a small revolt within her own party over special elections won by Republicans, defended the results, saying Democrats had actually done well in the heavily Republican districts. She even produced a small statistics card provided by one of her staffers. Evans called criticism of Pelosi's results in the elections "inside baseball" and added that no one in his district "talks to me about that." Evans said his constituents' main concerns are jobs and education.